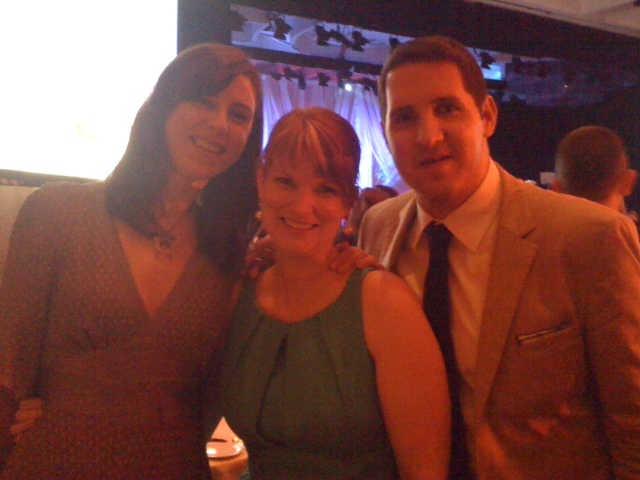 It was a great hono r for my little book, The Clearing, to be nominated for the RITA Award for Best Young Adult Romance of 2011. Last week, I got to go to New York City to see how it would all turn out. If you’ve never attended the RWA conference (Romance Writers of America) it’s huge and crazy. Speakers included Diana Gabaldon, Jennifer Crusie, Tess Gerritsen, and one of my heroes, Meg Cabot, was the emcee of the RITA awards. It’s a very cool conference and a ton of YA authors attend. Nervously, I went to dinner on RITA night with my lovely editor Julie Tibbott and my champion of an agent, Stephen Barbara. Seriously, even though we were at delicious Becco Restaurant, we could barely eat because we were so excited. 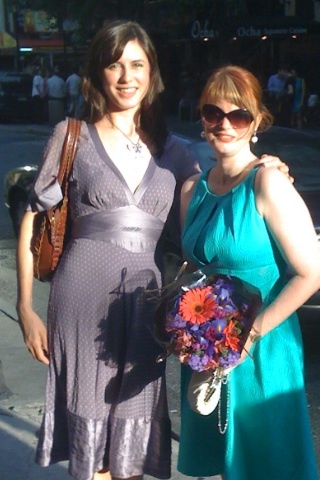 Here’s a picture of me and Julie with the gorgeous flowers she brought me. The only great thing about Julie Tibbott, among the many, actually, is that she truly believes in my work. She did an amazing job working with me on The Clearing and on my upcoming fall book, Wherever You Go. Julie was just sure that The Clearing was going to win the RITA. Man, she really wanted us to win. As she got more nervous at the prospect of accepting the award with me in front of 2,000 people, I got more nervous. Stephen did his best to calm us down, but it wasn’t working. Maybe he was a little nervous, too. 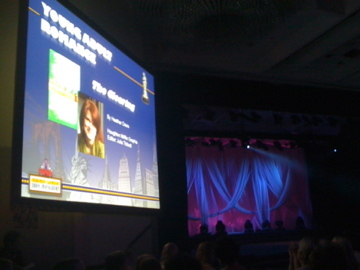 At the ceremony, the YA category finally arrived and The Clearing flashed up on the screen as a nominee. Julie and I held hands and prayed. And then– another book took home the award. The takeaway lesson was this: how wonderful it was to be nominated along with authors I really admire (Lisa Schroeder, come on!) and how much readers love The Clearing. The Clearing is a book I wrote in the middle of my own devastating heartbreak. A book I wrote when I had to start over in a new place, just like Amy. A book that tells of my own hopes to find a true love — one that can stand through tests of time and tide. And when readers tell me the places in the story where they cried, they are usually the ones I cried while writing. The hurt was fresh and present when I went to the keyboard each day. I think when you are a writer, it is your duty to go deep. To expose the scary places that hurt. To ask the questions you don’t have the courage to ask in real life. For me, fiction that moves, that inspires, that takes you somewhere, is the only fiction worth writing. I am truly grateful The Clearing got just a little of the spotlight last week. And I’m touched by the love I feel surrounding me and my work. ← Two Teen Authors in One Apartment! Congratulations on being nominated for the RITA Award. I’m looking forward to your new book, Wherever You Go.